We offer quality and durable crane steel structures for your workshops as well as heavy lifting equipment such as overhead cranes. The steel structure is a cost-effective option to erect various industrial buildings, such as workshops, warehouses and industrial sheds. It comes in two main types, including heavy steel structure and light steel structure. 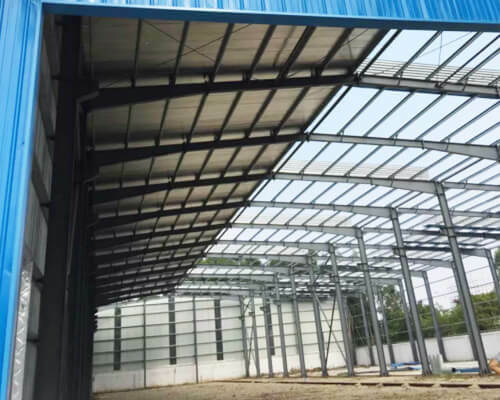 Due to the characteristics of the structural steel, this building type can be designed and constructed with large span. 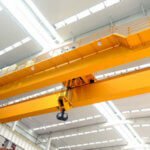 We also offer a range of overhead cranes to fit to your facilities. 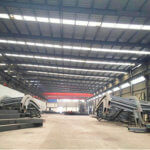 There are two main types of steel building construction offered by our company. 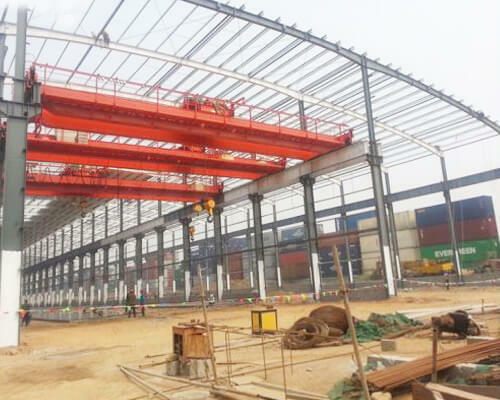 This metal structure is ideal for erecting heavy industrial buildings. It is super-quick to build at site and can last for decades. This structural form can be designed for different purposes, such as to process, design, store or distribute materials. The light steel construction is a new type of building construction that is perfect for small buildings. It uses thin sheets of steel, which can effectively utilize the building space and reduce the height of the facility. What’s more, it is more economical than other structural forms. If you require multiple overhead crane systems installing inside your facility, the crane supporting steel structures will be needed, such as runway beams and supporting columns. The frame structure can be designed to be single span, double span or multi span. The overall dimension depends on your requirements. 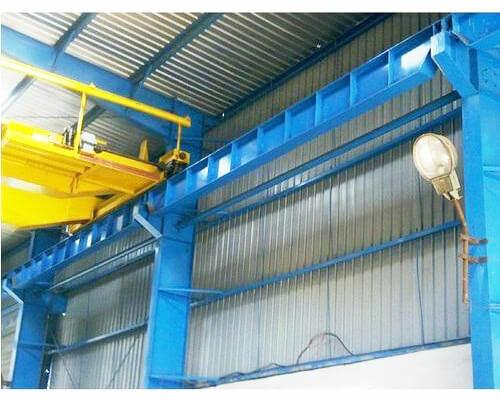 When installing an overhead crane inside the building, you should specify the desired crane specifications first, such as the rated load capacity, lifting height and span. We supply a variety of overhead bridge cranes to suit your lifting requirements, ranging from small capacity light duty overhead cranes to large capacity heavy duty overhead cranes. 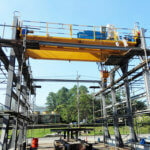 These cranes can be designed for general lifting purposes as well as special lifting applications. Steel column spacing: 6m, 7.5m, 9m, 12m, etc. This structure is very reliable due to the high strength grade of steel. The steel building requires less raw materials than other types of structure like concrete structure. What’s more, it requires less maintenance. It is designed with excellent fire resistance and corrosion resistance features, and can withstand extreme forces or harsh weather conditions, such as strong wind, heavy snow and earthquake. 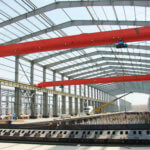 All the major components of the structure are pre engineered at factory, and then rapidly erected at desired location. The structural steel enables you to create large span. The structure can also take any kind of shape to your requirements. In addition, it can be easily modified or strengthened to suit your future uses. The steel can be recycled and reused without causing pollution. The metal structure is used for almost every type of structure, such as heavy industrial buildings and equipment support systems. 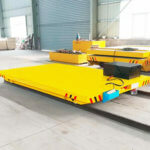 It is made of various structural steel components, which connect with each other to carry loads. These steel sections can be made to take any kind of shapes, sizes and gauges by hot or cold rolling. The structure consists of several components, including the primary components, secondary components and envelop materials. The primary components include steel columns, steel beams, wind-resistant columns and runway beams. The columns and beams are prefabricated at the factory through cutting, punching, assembly, welding, correction, shot blasting and painting. They are the main load-bearing member of the structure. The material can be Q235B or Q345B. The runway beams are used for supporting the crane track. 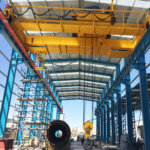 If you need to install an overhead crane in the building, a few things should be considered in the design of the structure, including the crane rated load capacity, lifting height, span, lifting speed, work duty and hook coverage so as to make sure the structure is sturdy enough to support the crane and runway systems. The secondary components consist of purlins (C-shaped, Z-shaped), purlin braces, bracing systems (horizontal and vertical bracing). Purlins are used to support the wall and roof panels. The thickness can be 2.5mm or 3mm. C-shaped purlins are the most commonly used type, while Z-shaped purlins are ideally suited to large slope roof. Braces are used to keep the lateral stability of the purlins. Horizontal and vertical bracing systems are used to guarantee the overall stability of the structure. Color steel tile and sandwich panels are available for you to choose from. Color steel tile is a kind of pressure plate that is rolled and cold-formed into various wave shapes by means of color-coated steel plate. The thickness is usually 0.8mm or less. Color steel sandwich panel is made of upper and lower metal panels and a polymer insulation in the middle layer. It feature light weight, easy installation and environmental protection. The thickness can be 50mm, 75mm, 100mm and 150mm. Another insulation method can be a combination of single layer color steel plate, insulation cotton and steel wire mesh. Fire resistance – fire-retardant coatings are generally applied to the surface of the structure to enhance the fire endurance of the component. Water proof – the sealant or welding treatment is taken at the joint of the plate to prevent seepage. Besides, it is better to use a long plate to eliminate lap joints. Sound & heat insulation – fill the soundproofing material inside metal roofing, and apply heat-reflective coating on the metal plate surface. Ventilation – for general buildings, the fan and clerestory are used. While for a large-span high steel structure building, it is better to install a large exhaust fan on the roof. Lighting – install lighting panels or lighting glass at specific locations on the roof. To receive a free quote of crane steel structures, please get in touch with our sales team now!